The Sustainability and Environmental Education Department offers an 11-month Master of Arts in Environmental Education. It is designed for people who want to work as passionate educators with students of all ages in diverse settings. Join us for ecological field work, principles of EE, leadership, land management, plenty of practice teaching and 3 weeks in rural Bahamas. What more do you need? The program is delivered in the 1,189-acre outdoor classroom at Merry Lea Environmental Learning Center . Your career may lead you to outdoor education, nonprofit camps, nature centers, state parks, federal agencies, municipal programs, public or private schools, non-government environmental organizations, or as an independent contractor. This is a holistic, enriching experience whether you are beginning your career or continuing a life long profession in environmental education. The Master of Arts in Environmental Education program is designed as a challenging intensive experience in all aspects of environmental education. Your 11-month experience includes extensive time in the outdoor classroom, indoor discussions, teaching, field trips, projects and several weekend conferences and workshops. In your practicum, you will work with grades preK-12, as well as adult groups who are visiting our environmental learning center. At the same time, our curriculum develops your skills to work with schools, businesses, parks, federal agencies, non-profit advocacy groups, churches and/or communities with a long-term commitment in caring for creation. This is your opportunity to become a leader in education and to contribute to the care, restoration and preservation of our environment. Completed degree in 11 months! A foundation of your experience is exploring and learning about our 1,189-acre preserve that contains wetlands, bogs, lakeshores, upland and lowland forests, prairies and meadows. Merry Lea is among the best-assembled land preserves in Indiana and the largest private preserve in the state. The area contains a diverse group of Indiana ecosystems that have been managed to provide both rare and typical Midwestern habitat. Our approach depends on knowing and understanding systems thinking. 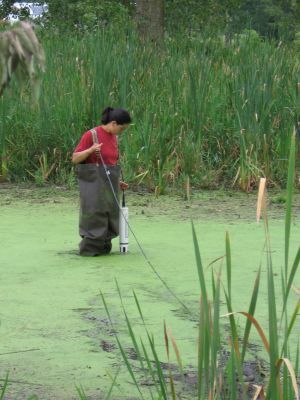 We use a natural history, research methods and land management classes to understand ecological systems. Then in principles of environmental education, issues and history, and leadership we learn to work in social systems. In the faith and peacemaking seminar we think about how to communicate between world views, and in the Bahamas we put it all together. The goal for us and our students, is to share our passion for the environment.